Come to Andalusia, Spain for a winter break and enjoy trail riding in the spectacular countryside! The weather is very kind in Granada Region. The trails are designed for total beginners with no experience to more advanced riders. This winter break is a complete package for you. Discover the best biking roads in Andalusia! During this motorcycle tour, you will be staying at a comfortable accommodation that sleeps 10 people. The accommodation is fully equipped with kitchens, lounges, hot tub or jacuzzi, an honesty bar, sun loungers for heating and cooling, free Wi-Fi, three terraces, a TV, books and magazines, and a drying area. You will be picked up at Málaga Airport (AGP) or Federico García Lorca Airport (GRX). Then, you will go to the base to complete paperwork, pick a bike, relax, and enjoy facilities. The village has bars, restaurants, and supermarkets. You will go on a trail, some tarmac, then forest trails. For beginners, you will spend some time learning techniques until you are confident enough. Then, you will stop for coffee and snack, then continue your trails, have a lunch break, and head for home to relax in a hot tub, for the brave ones. Some more of the same, hopefully, everybody is more confident and you will attempt some terrain that is more challenging. For experienced trail riders, Motorcycle Touring Spain has all levels of difficulty. Say goodbyes and return to the airport after an invigorating stay. For the less experienced rider, you will be given a tuition and you will have smoother trails to gain confidence. You can also stay longer or have the tour longer depending on your choice. You must have category A license and be over 25 years old to join this motorcycle tour. Also, no off-road experience is necessary as Motorcycle Touring Spain provides a tuition for you. You are also advised to apply for an International Driving Permit (IDP). Ron is the founder of Motorcycle Touring Spain. He is an experienced rider with 40 years of riding all kinds of bikes. He is just as comfortable on the road as he is off-road. Originally from Scotland, he has lived in Spain for 13 years with his Spanish partner, Ana. Ron is fluent in Spanish and has a vast knowledge of the local area, history, and customs. This motorcycle tours will take place in Spain including the trail riding in the Sierra Nevada, Alpujarras, Las Contraviesas, Andalusia, and Granada region. Breakfast is supplied to start the day that will include cereals, bread, cheese, ham, eggs bacon, yogurt fruit, tea and coffee, and orange juice. You have a choice of the three terraces to enjoy your breakfast. You will also be provided with complimentary water. Enjoy a hot tub at your accommodation after having a trail riding. Please book your flight to arrive at Málaga Airport (AGP) or Federico García Lorca Airport (GRX). Transfer from and to the airport is included. Motorcycle Touring Spain will pick you up from the airport. Airport: Federico García Lorca Airport Airport transfer included: Federico García Lorca Airport No additional charges. You can request this in the next step. 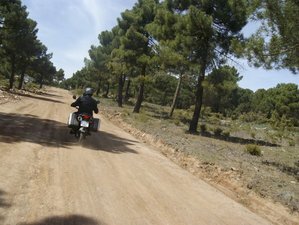 Motorcycle Touring Spain is a small tour company that specializes in guided motorcycle tours in Andalusia, Spain. They offer trail riding and tarmac tours.